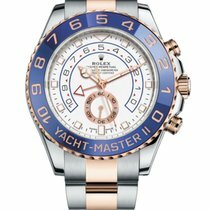 Stainless steel case with a stainless steel Rolex oyster bracelet with 18kt everose gold center links. Bi-directional rotating 18kt everose gold bezel with a blue top ring. 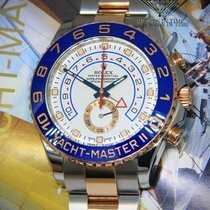 White dial with luminous blue hands and index hour markers. Yacht race markings. Minute markers around the outer rim. Dial Type: Analog. Luminescent hands and markers. Chronograph - sub-dials displaying: seconds. 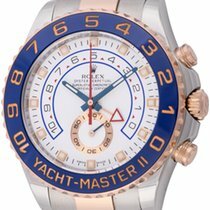 Rolex calibre 4160 automatic movement with a 72-hour power reserve. Scratch resistant sapphire crystal. Screw down crown. Solid case back. Round case shape. Case size: 44 mm. Band length: 7 inches. Oysterlock clasp. Water resistant at 100 meters / 330 feet.